John Elmer "Jack" Carson (October 27, 1910 – January 2, 1963) was a Canadian-born, American film actor. Though he was primarily used in supporting roles for comic relief, his work in films such as Mildred Pierce (1945) and Cat on a Hot Tin Roof (1958) displayed his mastery of "straight" dramatic actor roles as well. He worked for RKO and MGM (cast opposite Myrna Loy and William Powell in Love Crazy, 1941), but most of his memorable work was for Warner Bros. His trademark character was the wisecracking know-it-all, typically and inevitably undone by his own smug cockiness. From the trailer for The Hard Way (1943). He was born in Carman, Manitoba, Canada to Elmer[a][b] and Elsa Carson (nee Brunke). He was the younger brother of actor Robert Carson (1909 - 1979). His father was an executive with an insurance company. In 1914, the family moved to Milwaukee, Wisconsin, which he always thought of as his home town. He attended high school at Hartford School, Milwaukee, and St. John's Military Academy, Delafield, but it was at Carleton College that he acquired a taste for acting. Carson became a U.S. citizen in California in 1949. Because of his size – 6 ft 2 in (1.9 m) and 220 lb (100 kg) – his first stage appearance (in a collegiate production) was as Hercules. In the midst of a performance, he tripped and took half the set with him. A college friend, Dave Willock, thought it was so funny he persuaded Carson to team with him in a vaudeville act – Willock and Carson – and a new career was born with "a very successful comedy team that played large and small vaudeville theatres everywhere in North America". This piece of unplanned business would be typical of the sorts of things that tended to happen to Carson in many of his film roles. After the act with Willock broke up, Carson teamed with dancer Betty Alice Lindy for appearances in theaters on the Orpheum Circuit. Radio was another source of employment for the team, starting with a 1938 appearance on the Kraft Music Hall when Bing Crosby hosted the show. In 1942–1943, he was host of The Camel Comedy Caravan, and in the next season he starred in The New Jack Carson Show, which debuted on CBS June 2, 1943. Charles Foster wrote about the show in Once Upon a Time in Paradise: Canadians in the Golden Age of Hollywood: "It broke audience records regularly during the four years it was on the air. Hollywood's biggest stars ... lined up to do guest spots on the show." Suspense episodes starring Jack Carson: June 28, 1959 "Analytical Hour" with John Hoyt and Sam Pierce. From 1950 to 1951, Carson was one of four alternating weekly hosts of the Wednesday evening NBC Television comedy-variety show Four Star Revue. (The others were veterans Jimmy Durante and Ed Wynn, and up-and-coming young Danny Thomas.) The second season was his last with the show, when it was renamed All Star Revue. His success in radio led to the start of a lucrative film career. During the 1930s, as vaudeville declined from increased competition from radio and the movies, Willock and Carson sought work in Hollywood. Carson initially landed bit roles at RKO Radio Pictures in films such as Bringing Up Baby (1938), starring Cary Grant and Katharine Hepburn. An early standout role for Carson was as a mock-drunk undercover G-Man opposite Richard Cromwell in Universal Pictures's anti-Nazi action drama entitled Enemy Agent. This led to contract-player status with Warner Brothers shortly thereafter. While there, he was teamed with Dennis Morgan in a number of films, supposedly to compete with Paramount's popular Bing Crosby - Bob Hope Road to … pictures. Most of his work at Warner Brothers was limited to light comedy work with Morgan, and later Doris Day (who in her autobiography would credit Carson as one of her early Hollywood mentors). Critics generally agree that Carson's best work was in Mildred Pierce (1945), where he played the perpetually scheming Wally Fay opposite Joan Crawford in the title role. Also in 1945, he played the role of Harold Pierson, the second husband of Louise Randall, played by Rosalind Russell, in Roughly Speaking. Another role which won accolades for him was as publicist Matt Libby in A Star is Born (1954). One of his last film roles was as the older brother "Gooper" in Cat on a Hot Tin Roof (1958). His TV appearances, extending into the early 1960s, included The Martha Raye Show, The Guy Mitchell Show, and The Polly Bergen Show in 1957; Alcoa Theatre and Bonanza (Season 1, Ep.9: "Mr. Henry Comstock") in 1959; Thriller ("The Big Blackout") in 1960; and The Twilight Zone (Season 2, Ep. 14: "The Whole Truth") in 1961. His TV pilot, Kentucky Kid, was under consideration as a potential series for NBC, but was not picked up by the network. The proposed series would have had Carson playing a veterinarian widower who raises horses and has an adopted Chinese child. His brother Robert was also a character actor. On February 8, 1960, Carson received two stars on the Hollywood Walk of Fame for his contributions to the television and radio industry. The television star is located at 1560 Vine Street, the radio star is at 6361 Hollywood Boulevard. In 1983, after his death, Jack Carson was inducted into the Wisconsin Performing Artists Hall of Fame along with his film pal, Dennis Morgan, who was also from Wisconsin. In 1962, while rehearsing the Broadway play Critic's Choice, he collapsed and was subsequently diagnosed with stomach cancer. He died in Encino on January 2, 1963, aged 52. Carson was entombed in Glendale's Forest Lawn Memorial Park Cemetery. Carson married four times: Elizabeth Lindy (married 1938, divorced 1939), Kay St. Germain (1941–1950), Lola Albright (1952–1958), and Sandra Jolley (1961–1963), former wife of actor Forrest Tucker and daughter of character actor, I. Stanford Jolley. Carson had a romantic relationship between his second and third marriages with Doris Day in 1950–51, but she left him for Marty Melcher, who would become her third husband. ^ The "Jack Carson" section in the book Once Upon a Time in Paradise: Canadians in the Golden Age of Hollywood gives the father's name as "Edward L. Carson". ^ a b c d Foster, Charles (2003). Once Upon a Time in Paradise: Canadians in the Golden Age of Hollywood. Dundurn. pp. 59–77. ISBN 9781550024647. Retrieved 22 June 2017. 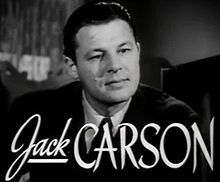 ^ "Jack Carson". Classic Images. Archived from the original on 22 June 2017. Retrieved 22 June 2017. ^ a b Terrace, Vincent (1999). Radio Programs, 1924-1984: A Catalog of More Than 1800 Shows. McFarland & Company, Inc. p. 60. ISBN 978-0-7864-4513-4. ^ "Air Ya Listenin?". The Mason City Globe-Gazette. Iowa, Mason City. June 2, 1943. p. 2. Retrieved May 5, 2016 – via Newspapers.com. ^ a b Terrace, Vincent (2011). Encyclopedia of Television Shows, 1925 through 2010 (2nd ed.). Jefferson, N.C.: McFarland & Company, Inc., Publishers. p. 520. ISBN 978-0-7864-6477-7. ^ "Jack Carson | Hollywood Walk of Fame". www.walkoffame.com. Retrieved 2016-06-26. ^ "Jack Carson". latimes.com. Retrieved 2016-06-26. ^ "Hall of Fame a gala premiere". Milwaukee Journal Sentinel, "Let's Go section, Page 2. Retrieved 2014-12-29. ^ Day, Doris; Hotchner, A.E. (Oct 1976) . Doris Day: Her Own Story (Bantam mass market paperback) (6th printing ed.). New York: William Morrow. p. 108. ISBN 0-553-02888-X. ^ "Jack Carson Is Suspense Star". Harrisburg Telegraph. November 2, 1946. p. 19. Retrieved September 28, 2015 – via Newspapers.com. ^ "Listen to and download the Burns and Allen Radio Programs, The Jack Carson Acting Contest, Courtesy of Jimbo Berkey". free-classic-radio-shows.com. Wikimedia Commons has media related to Jack Carson.